The Gorskys are the world’s first dot.com-edians. This site is our attempt to make the web funny. 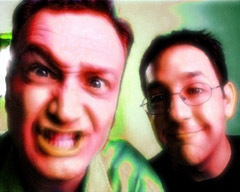 Liam Cody andÂ Chris Tomkins have been performing together since 1992, live, on radio, TV, and the web. We have also won some awards. We want to keep this biography brief because we desire to be enigmas wrapped up in mysteries and covered in chocolate. And we’re lazy. Why not buy us a beer? GORSKYS.COMedy is part of theÂ Global Ant Empire.